Alexandria Egypt has a very impressive and storied past, beginning with its founding by Alexander the Great around 331 B.C. 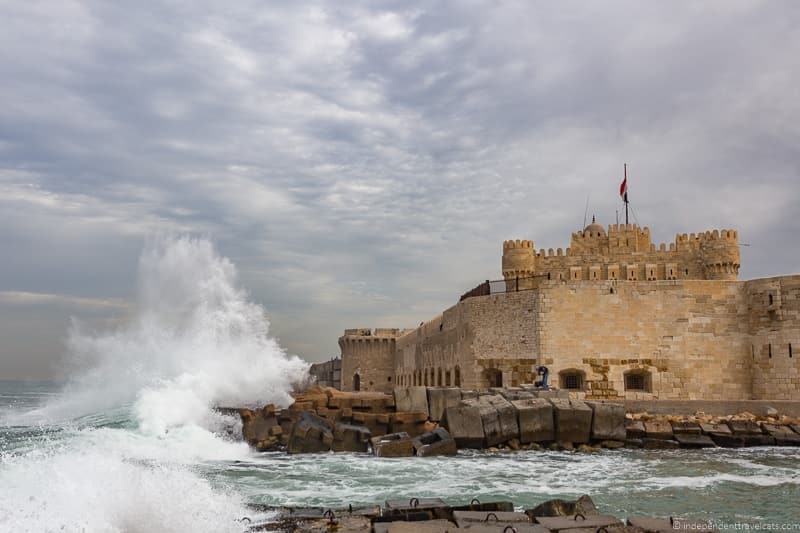 Nicknamed the Pearl of the Mediterranean and affectionately referred to as Alex by locals, Alexandria is a Mediterranean port city and the second largest city in Egypt. 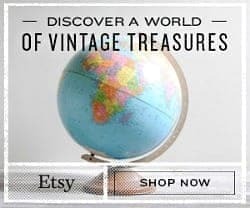 During the Hellenistic period, it was home to both the legendary Great Library of Alexandria and the Pharos, a lighthouse ranking among the Seven Wonders of the Ancient World. Alexandria was the setting for the stormy love story between Julius Caesar, Cleopatra, and Marc Antony as well as a cosmopolitan gathering spot for intellectuals in the early twentieth century. The city has definitely lost some of the grandeur of its past and today’s Alexandria is filled with concrete apartment buildings, office buildings, and traffic-filled streets. However, with a bit of searching travelers can still find bits of Alexandria’s glorious past. These includeGreco-Roman monuments, beautiful gardens, the 15th century Qaitbay Citadel, palaces, Old-World cafés, the Alexandria Opera House, and even sunken treasure. 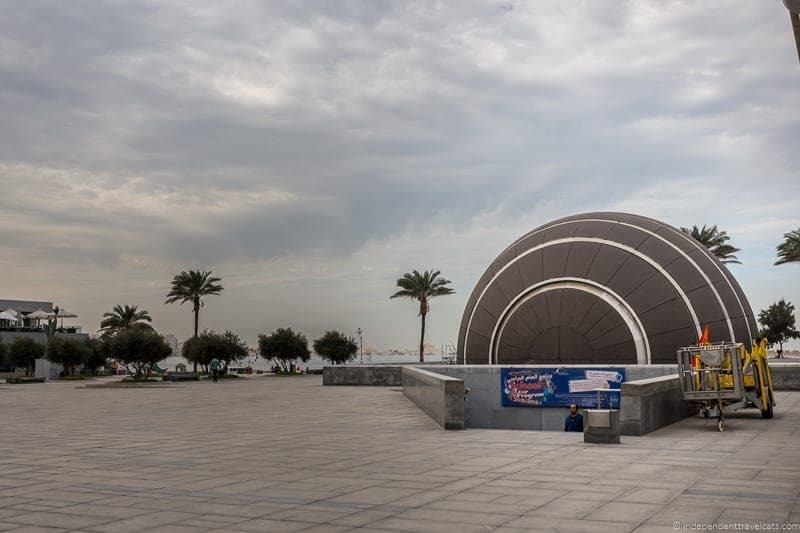 Visitors can also seek knowledge at several museums, explore the modern Bibliotheca Alexandrina, relax at one of the city’s many beaches, and visit several important religious sites. 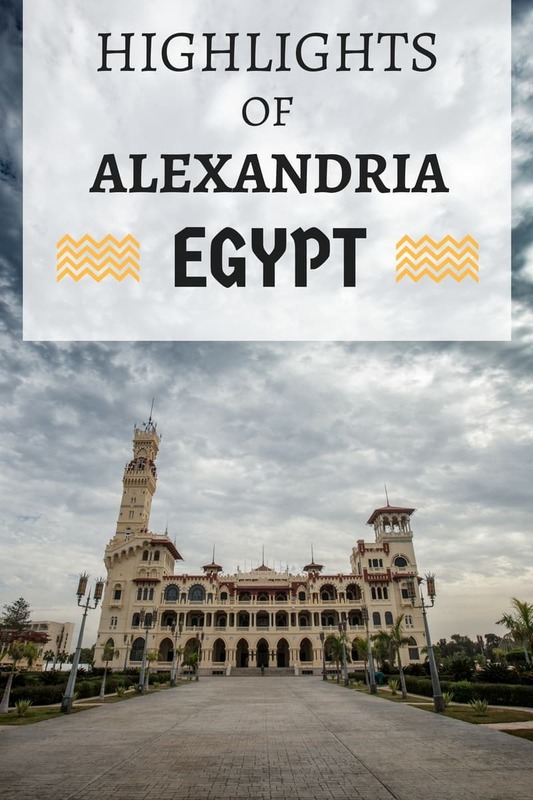 Many people visit Alexandria as a cruise stop or as a day trip from Cairo (as we did), but it can also be a great place to base for a few days. We share practical tips on getting to and getting around Alexandria, top things to do in Alexandria, and how to put together your own perfect itinerary for Alexandria Egypt. Alexandria is located in north central Egypt along the coast of the Mediterranean Sea. Alexandria is located 225 km (140 miles) northwest of Cairo, taking about 2.5 to 3.5 hours to drive from one city to the other depending on route and traffic. Most travelers are heading to Alexandria from Cairo or vice versa, and travelers have a lot of options in traveling between the two cities. You have the option to take a domestic flight, train, bus, or taxi. You can also join a guided tour, hire a private car service, or rent a car. 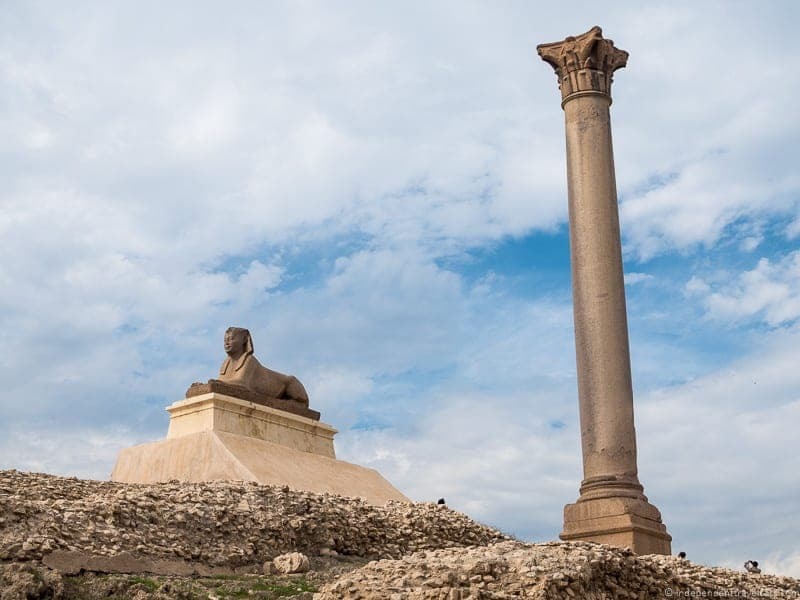 A guided tour is a great way to do a day trip to Alexandria from Cairo as you’ll have your transport covered and a guide who can help take you to all the highlights in the city. If you want to travel independently, I’d consider the train. For those who want the least hassle, consider joining a day tour or hiring a private car service. Those on a tight budget should consider a bus, although train tickets are also quite reasonably priced. Daily domestic flights between Cairo and Alexandria (and several other locations in the country) are operated primarily by EgyptAir. Note that the Alexandria International Airport is currently closed (since 2011) and the Borg El Arab International Airport is the main functioning airport; it is located about 40 km (25 miles, 1 hour drive) from the city center of Alexandria. Flights take about 45 minutes. There is a good inexpensive train service between Cairo and Alexandria, with most train taking 2.5 to 3 hours. Most trains leave and arrive into the main Cairo rail station, Ramses Station, and there are two main intercity stations in Alexandria, the Misr Station (primary) and the Sidi Garber station. I’d recommend taking one of the 1st class modern air-conditioned express trains for the most comfort and time savings. You can check train schedules and buy tickets online here (click on English button) and if you have any difficulties, read this guide to buying train tickets in Egypt as booking train tickets in Egypt can take some patience. Booking regular class passage on ordinary trains can be restricted for tourists although it is possible as I spent about 15 hours traveling on ordinary trains within the country, but they are less comfortable and typically slower than the 1st class trains. Buses between Cairo and Alexandria usually take 2.5 to 3.5 hours.There are a number of regular bus services from Cairo to Alexandria and vice versa with a number of bus companies, including Go Bus, West Delta Company, and Super Jet. Finding up-to-date and reliable bus schedules can be difficult. It is best to either book online in advance or book once in Egypt from your hotel or at the bus station. Buses routes between Cairo and Alexandria usually take 2.5 to 3.5 hours. You can also hire a taxi or private transfer to take you between the two cities, which will take between 2.5 to 3 hours. Taxis are readily available from the airports, train stations, bus stations, or you can arrange one through your hotel. Or you can book a private transfer in advance online. You can find many companies and individual licensed guides offering guided group bus tours and guided private day tours to Alexandria from Cairo. Tours are a convenient hassle-free way to get back and forth between the two cities and gives you a built-in Egyptologist guide. Before booking, I would compare tour prices, itineraries, and inclusions. One result of the unfortunate decline in Egypt’s tourism, is that prices are really good in Egypt for tourists so you can book a tour for much less than in many other countries. This full day tour includes full-trip transport, entrance fees to three attractions, and lunch. Focus on historical sites. This guided day tour includes full-trip transport, entrance fees, and lunch. Includes a visit to St. Mark Church and chance to visit Abbo Elabbas Mosque. This private day tour includes round-trip transport, a Egyptologist guide, visits to most of the city’s highlights, and entrance fees. The itinerary is similar to the day trip we did. This overnight trip includes round-trip transport, a guide, entrance fees, overnight lodging in Alexandria, and breakfast. Staying overnight gives you plent of time to see all of the highlights in Alexandria. We did a day trip as a side trip to a much longer Egypt tour we took with Travel Talk Tours. If interested in a longer guided trip, you can also read about our experience with Travel Talk Tours on a 9-day tour in Egypt tour written by Laurence. Renting a car in Egypt is fairly easy and many international car hire agencies have offices at the airports as well as major cities, including Cairo and Alexandria. You’ll just need to get an International Driving License (see how to apply in your country) in order to rent and drive a car in Egypt. There are two main routes between Cairo and Alexandria, the faster Route 75 (has tolls) or you can take the slower Alexandria Agricultural Road via Tanta. While it can be easy enough to rent a car, visitors who are not used to Egyptian driving may find driving and parking a stressful experience especially in the densely packed downtown areas. I would recommend reading about other travelers’ driving experiences before choosing to drive yourself as many well-traveled drivers find driving in Egypt, especially Cairo, a nightmare. The trip from Cairo to Alexandria is fairly straightforward but for those planning to go elsewhere be aware that some desert roads are not open to tourist traffic and some roads are not in the best condition if you go off the main routes. Within Alexandria, there are a number of public transit options, including the tram network, the commuter rail, and public buses. There are also the informal microbuses, but since Alexandria has a public bus system, you don’t need to rely on these as they can be difficult to figure out. Here is a decent breakdown of transportation options within Egypt by Lonely Planet, although concrete information is difficult to provide and hard to attain. Schedules can be difficult to find so check at bus and tram stops, or ask at a hotel for assistance. Having the names of places you want to go written down in Arabic as well as English can make it easier for locals to point you in the right direction. Note that numbers are often written in Arabic so having a table of Arabic number with you is a very smart idea. Taxis are also abundant although best to ask hotel staff or a local for normal fare prices and be very clear upfront in negotiating fares with drivers. How much time do I need to visit Alexandria? Most people will be able to cover all the major sites, and some minor ones, by spending 3 days in Alexandria. If you just want to visit a few of the major highlights, you can do this on a day trip from Cairo or by spending a full day and overnighting in Alexandria. If I could return, I would definitely have spent a night in the city to see more sites. Where should I go if I only have one day in Alexandria? 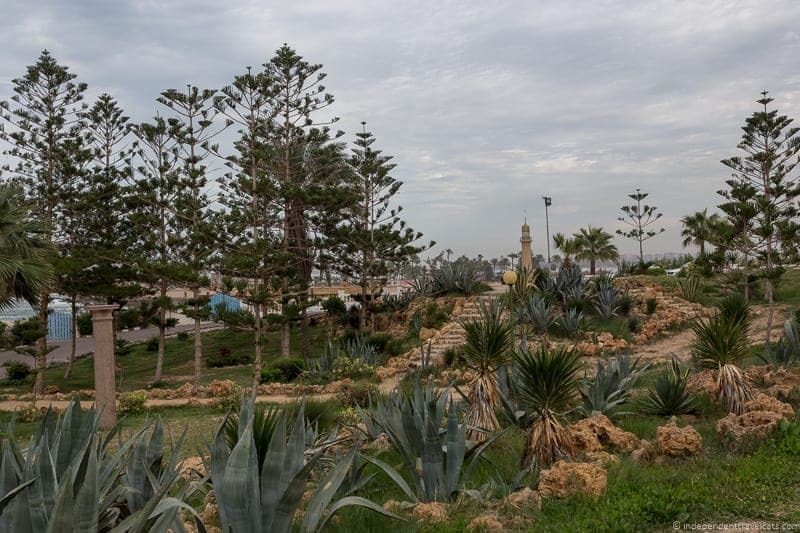 Finally, head to the Montaza Gardens to see the Al-Haramlik Palace (exterior) and visit the gardens. If you are interested, you can also add a view of the beautiful Abu al-Abbas al-Mursi Mosque to the above as it is only a 15 minute walk from the citadel or a short drive away from this route. Note that the above is a packed day requiring an early start (especially if you are coming from Cairo!) as although the distances between these sites are not that great, you could spend over an hour getting from the library to Montaza Palace if traffic is bad. The above is also easier to accomplish in terms of time with some form of private transportation (driver, tour, rental car) although possible with public transportation although it will likely take longer to get from place to place. Best time of year to visit Alexandria Egypt? Alexandria, unlike most of Egypt, has a Mediterranean climate, with hot humid summers and mild rainy winters. It is humid throughout the year, but summers are particularly humid during the daytimes and temperatures can be very hot although the sea breezes can help. Many Egyptians vacation in Alexandria during the summer to escape the heat in Cairo and surrounds. Winters can be rainy and cool. The best time to visit Alexandria in terms of both weather and crowds is in the Spring (March-early June) and Autumn (September-November). Some tips for getting the most out of your trip to Alexandria? First, as in much of Egypt (and Africa) having a guide is really useful as there are few information signs in English and it can be difficult to really appreciate a museum or archaeological site without some proper background information. We had a Egyptologist guide with us on our tour which really helped us get more out of some of the sites. If you are not interested in a guide or one is a bit outside you budget, you might consider buying a good guidebook to Egypt to help you as you tour the main sights. A guide is not needed for the Alexandria Library as a member of the library staff provides a free 30 minute guided tour (English is an option) with the entrance fee. 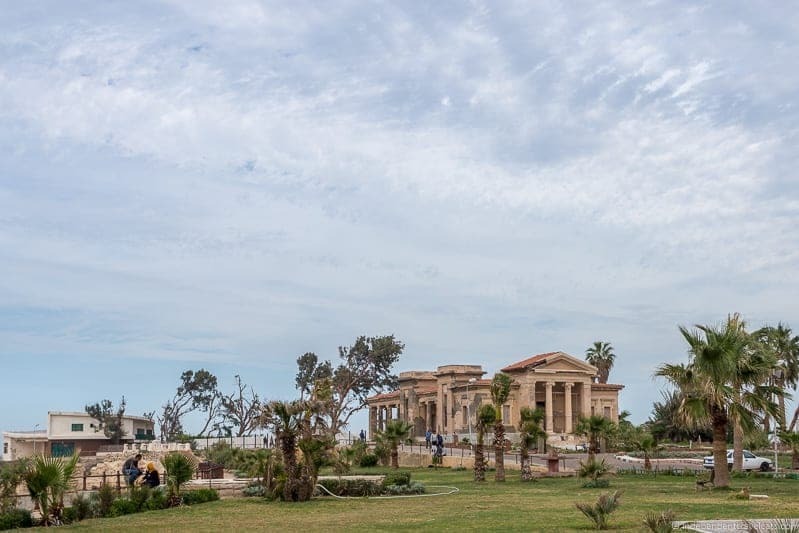 Note that almost all attractions in Alexandria have an entry fee, including some gardens and beaches (fee normally includes beach gear and access to toilets). Entry fees normally range between 5 to 50 EGP, the library was the most expensive at 70 EGP. Another helpful tip, especially if you are traveling independently, would be to have a cheat sheet to common Arabic phrases and numbers with you. The numbers can be particularly important in figuring out prices, bus numbers, train seats, etc. and writing down the names of places you want to visit in Arabic can really be helpful when asking for directions or giving instructions to a taxi driver. Carrying smaller bills and coins is also helpful as we found that some shopkeepers were unable to provide change for large notes. Tipping is customary for services and it is good to always have a few Egyptian pound coins on you for tipping folks such as shoe attendants and bathroom attendants (while not obligatory to leave a tip, a 50 pt or 1 pound Egyptian coin is appreciated). Finally, dressing modestly is seen as a form of respect for the local culture, and will also help prevent experiencing hostile stares and comments from locals. Although a seaside town, Alexandria is much more conservative than Red Sea resorts which caters to international tourists. Women are generally modestly dressed even on the beaches here although there are exceptions (particularly at a few of the private international hotel beaches). Those interested in entering any of the mosques or other religious sites will need to be dressed modestly and women may want to bring along a scarf or wrap for these visits. Egypt has had it share of violence and terrorist incidents in recent years, although very little has been directed or affected tourists. However, crime does occur and it is best to check for current travel warnings and advisories as issued by your home country, and to take regular safety precautions when traveling. The most common type of crimes tourists may experience is petty crime like theft and purse snatching, so be cautious with any valuables you have with you. You can find some further visitor information at the official Egypt tourism website and the tourism website for Alexandria. We didn’t have a guidebook in Egypt, but the Rough Guide to Egypt was one of the most highly recommended to us and there is also a Lonely Planet Egypt guide. 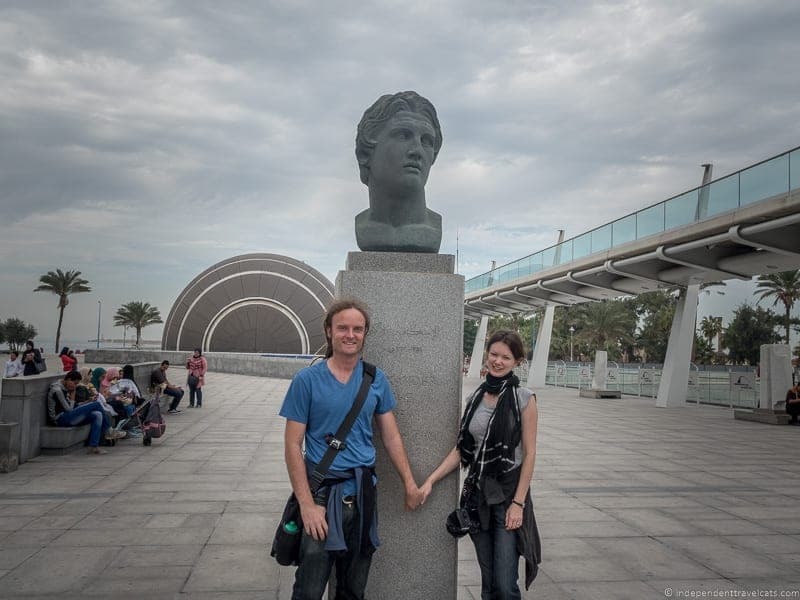 While in Alexandria, the Library of Alexandria (Bibliotheca Alexandria) is a good place to buy a good map and also get information about the city. I have long wanted to visit Alexandria; my desire heavily bolstered by the epic film Cleopatra starring Elizabeth Taylor and Richard Burton. Alexandria Egypt was the setting for so many historic events, dramatic stories, and great architectural feats. 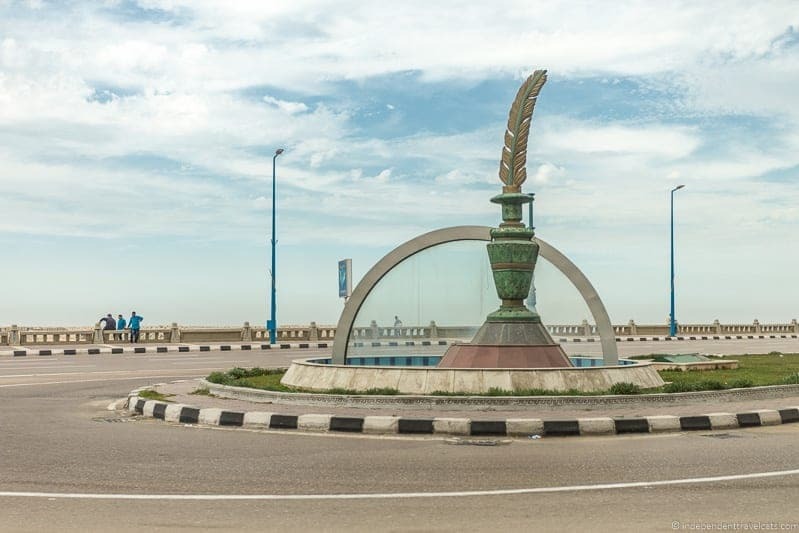 However, Alexandria is no longer the cosmopolitan cultural hub it once was and is now home to high-rise concrete apartment blocks, modern hotels, and traffic-filled streets. But with some patience, you can still find evidence of the ancient pharaohs, the Greeks, the Romans, the royals, and the early twentieth century intellectuals sitting alongside apartment complexes and office buildings. There are plenty of things to do in Alexandria Egypt that will fit a range of interests and budgets. Below you’ll find a list of the highlights of Alexandria Egypt to help you put together your perfect itinerary for a one day or multi day tour of the city. 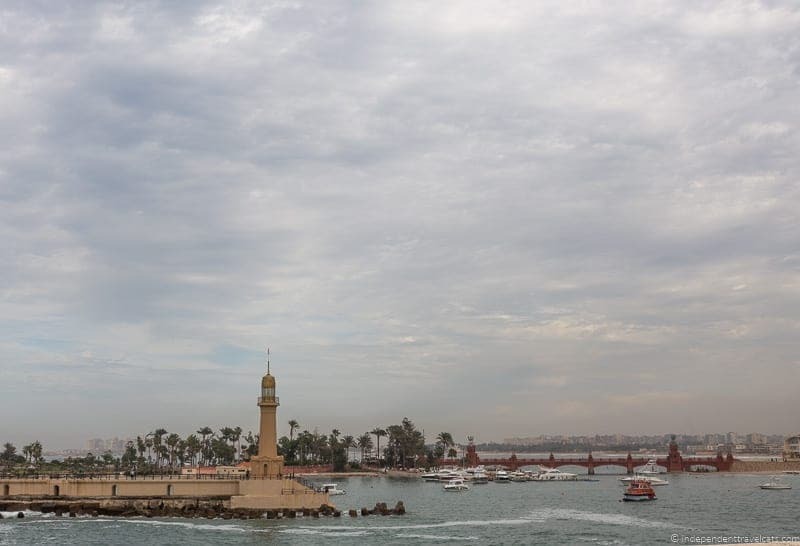 The Lighthouse of Alexandria, often referred to as The Pharos or the Pharos of Alexandria, was a large lighthouse built by the Ptolemaic Kingdom between 280 and 247 BC and is estimated to have been about 140 meters tall (450 feet). It was constructed of stone, probably white-washed limestone (although some say marble), and light was produced at the top by a furnace to guide ships safely into Alexandria harbor. It was one of the Seven Wonders of the Ancient World and was one of the tallest manmade structures in the world during its time. Unfortunately you can’t see the great Lighthouse of Alexandria today as it was badly damaged by earthquakes and by 1323 AD was abandoned, although it survived until about 1480 AD when the remaining stones of the tower were used in the construction of the Citadel of Qaitbay. The Citadel of Qaitbay sits on the same spot where the Lighthouse once stood. Some submerged remains of the former lighthouse have been discovered relatively recently in the Alexandria Harbor, and these can be seen by divers. There are plans to get UNESCO protection for these remains and also open up an underwater museum so more visitors can view them. 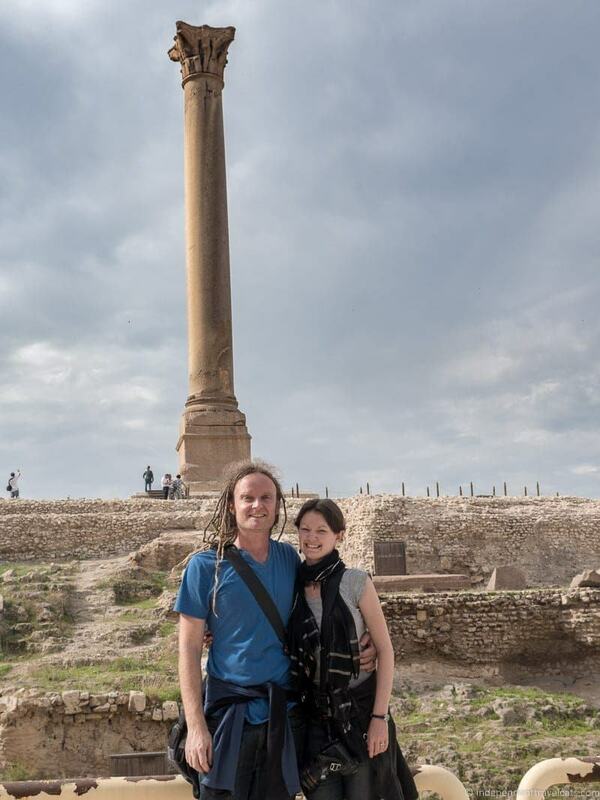 For us, it was enough to just sit and imagine the amazing ancient structure and imagine the time when famous figures like Julius Caesar used the lighthouse to guide their ships into the harbor. The Citadel of Qaitbay was built in 1480 A.D. by the Mamluk Sultan al-Ashraf Qaitbay, and was one of the most important defensive strongholds for Egypt along the Mediterranean Sea. As noted above, some of the remaining stones from the ancient Lighthouse of Alexandria were used in its construction. The fortress was upkept by subsequent rulers due to its strategic importance and protection against Ottoman attacks, and in 1882 it was serious damaged by the British during the Urabi Revolt. 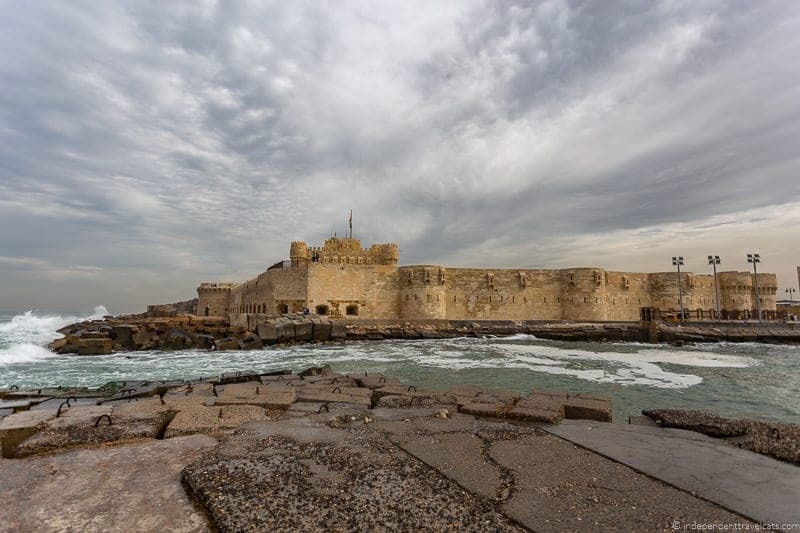 After this attack, the fortress fell into neglect and ruin until King Farouk turned it into a royal palace in 1904. After the Egyptian revolution in 1952, it was then decided that it would be restored and turned into a maritime museum. If you want to visit the inside (entrance fee), the rooms of the fortress are mostly empty but there are great views of the harbor from the terrace (watch out for waves) and there is also a mosque and small maritime museum to explore. From the harbor, there are great views of the citadel with the waves crashing into its outer walls. Many visitors walk along the harbor and then have lunch at one of the seafood restaurant for the local fresh fish and to enjoy the harbor views. 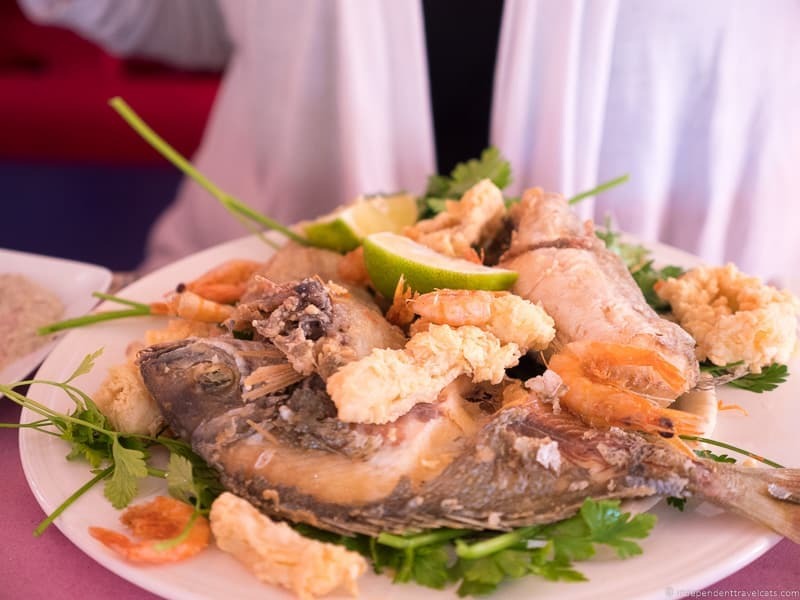 In terms of cuisine, Alexandria offers many of the same options you’ll find throughout Egypt but is best known for its seafood. There are many seafood restaurants with views located within walking distance of the Citadel of Qaitbay and eastern habor, such as the popular White and Blue Restaurant (also known as the Greek Club, 5 minutes from citadel) located on the top floor above the Greek Nautical Club of Alexandria. Another popular nearby restaurant with a view (although a bit pricey) is the Fish Market (15 minute walk from citadel). Elsewhere in Alexandria, there is also Abou Ashraf (28 Sharia Safar Pasha) which is a much simpler place without a view but known for its freshly caught fish cooked to order. For those interested in the local fishing industry and willing to get up early, you might want to visit the Anfushi Fish Market (10 minute walk from Citadel of Qaitbey). Every morning after dawn the local fishermen arrive with their catches and a daily fish auction is held. The ancient Great Library of Alexandria is believed to have been one of the largest and most significant libraries of the ancient world and an important place of scholarship. Founded by Macedonian general and pharaoh Ptolemy I Soter I, the Great Library is believed to have contained a giant collection of famous works (most written on Papyrus scrolls), and to have been a place where many of the world’s most famous ancient thinkers came to study. The library was famously burned during a siege when Julius Ceasar’s army set fire to the city in 48 B.C. and may or may not have been completed destroyed. There is some evidence it may have continued on and then been completely destroyed during an attack by Roman Emperor Aurelian in the 270s A.D. 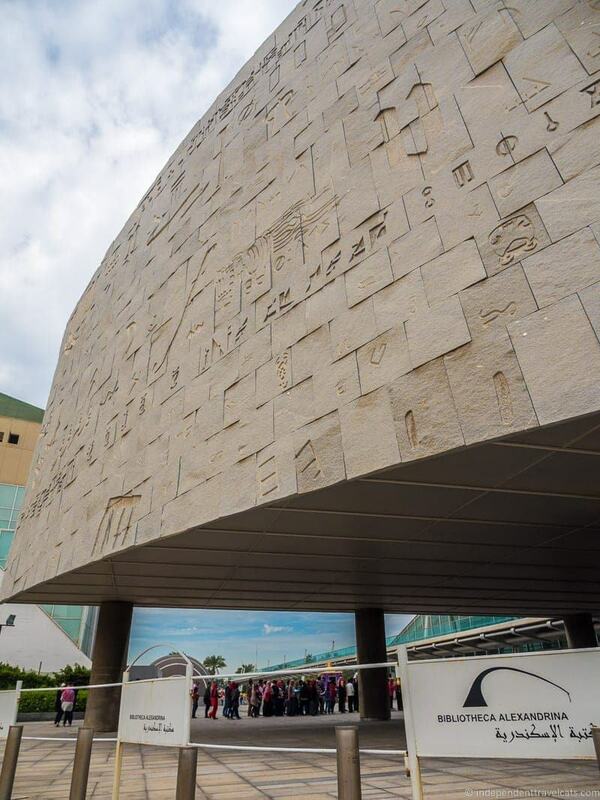 In 2002, a new library, the Bibliotheca Alexandrina was officially opened as a library and cultural center and a commemoration of the original Library of Alexandria, being built at a location near where the original is believed to have stood. The modern disc-shaped library has a large and impressive reading room. It houses books in three main languages: Arabic, French, and English and contains a number of museums, galleries, and temporary exhibits. 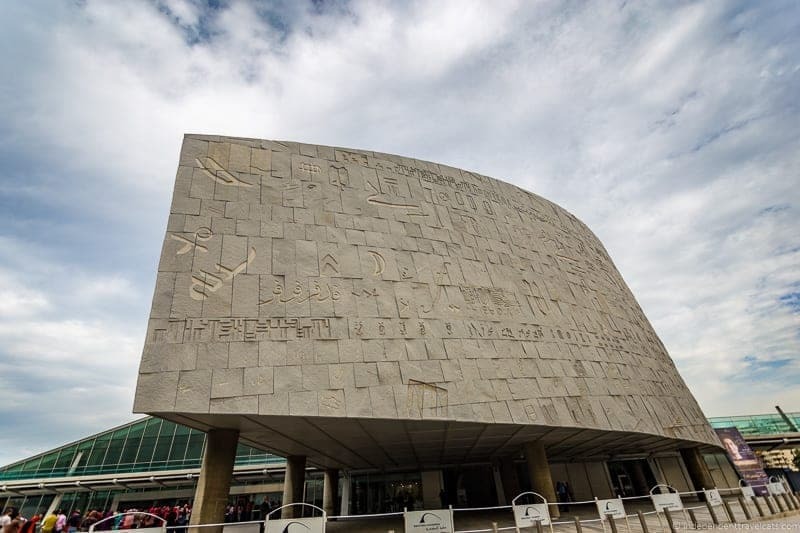 It is one of the most modern public buildings in Egypt and one of the most costly (many Egyptians believe too much money was spent on building the library), with an interesting exterior made of Aswan granite, carved with characters from 120 different human scripts. The library is air-conditioned so a perfect place to escape on a sweltering summer afternoon. There is an entrance fee to the library (currently EGP 70 for non-Egyptians) which includes a 30-minute guided tour (available in 4 languages) from a library staff member. 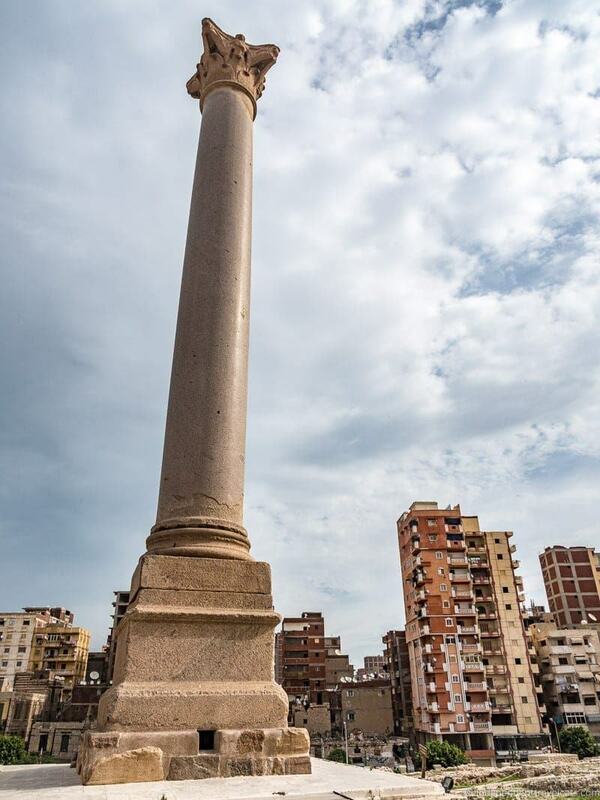 Although the religious sites in Alexandria are perhaps not as grand as some of those in Cairo, with its important seaport Alexandria has long been an important place for trade and a cosmopolitan city, having residents of all faiths and religions. Probably the most famous mosque in Alexandria and the largest is the Abu al-Abbas al-Mursi Mosque which has a beautiful cream-colored exterior and contains the tomb of the 13th century saint Abul abbas al-Mursi. Much of the current building dates from 1775 with renovations in the twentieth century. Non-Muslim visitors can visit the Abu al-Abbas al-Mursi mosque as well as some of the other main mosques of Alexandria, but all visitors must be modestly dressed, women should cover their head, and shoes must be removed upon entry. Women are not allowed in the main area of the mosque, but can visit the mausoleum and can view the main interior from behind a barrier. Entrance doors are separate for men and women. If you decide to enter, bring coins to give to shoe keepers for tips. Two other popular mosques in Alexandria are the El Nabi Daniel Mosque (some believe that it may contain the Alexander the Great tomb) and the Imam Al Busiri Mosque (dedicated to an Islamic poet). There are also some interesting Christian and Jewish places of worship in Alexandria. An interesting Christian church is St. Mark’s Coptic Orthodox Cathedral, which is said to have been originally founded by Saint Mark the Evangelist and is the historic seat of the Pope of Alexandria. It is believed that a cathedral was founded in 60 A.D. by Saint Mark but the church was destroyed or torn down many times and most of the current structure dates from the nineteenth and twentieth centuries. The body of Saint Mark the Evangelist is believed to have been buried here after his death. However, the Venetians are then said to have stolen most of the saint’s body in order to have relics for their own now-famous St. Mark’s Basilica in Venice. Saint Mark’s head is believed to still be buried here and a few other relics are said to be in St. Mark’s Cathedral in Cairo. For those interested in the history of Jews in Egypt, you might want to check out the Eliyahu Hanavi Synagogue which was originally built in 1354, destroyed by the French in 1798, and then rebuilt in 1850. This large synagogue attests to the fact that at one point, there was a thriving Jewish community in Alexandria which has dwindled to a very small community today following the founding of Israel, the 1948 Arab-Israeli War, and Suez Crisis. The interior of the synagogue is rarely open given the small community and security issues, so if you want to get inside you can try to arrange a visit in advance with a member of the local Jewish community (e.g., Ben Youssef Gaon) or try your luck by asking the guards at the front gate. There are several archaeological sites in and around Alexandria. We visited Alexandria prior to visiting any other major archaeological sites in Egypt so we really enjoyed them, but these may not be very impressive to those who just visited places such as the Valley of the Kings and Abu Simbel. One of the most popular to visit is Pompey’s Pillar (a.k.a. Column of Diocletian), which is the largest Roman triumphal column constructed outside Rome or Constantinople. The column is made of a single piece of Aswan granite along with a base and Corinthian capital and is one of the largest ancient monoliths ever constructed. The full column stands over 26 meters tall (85 feet). 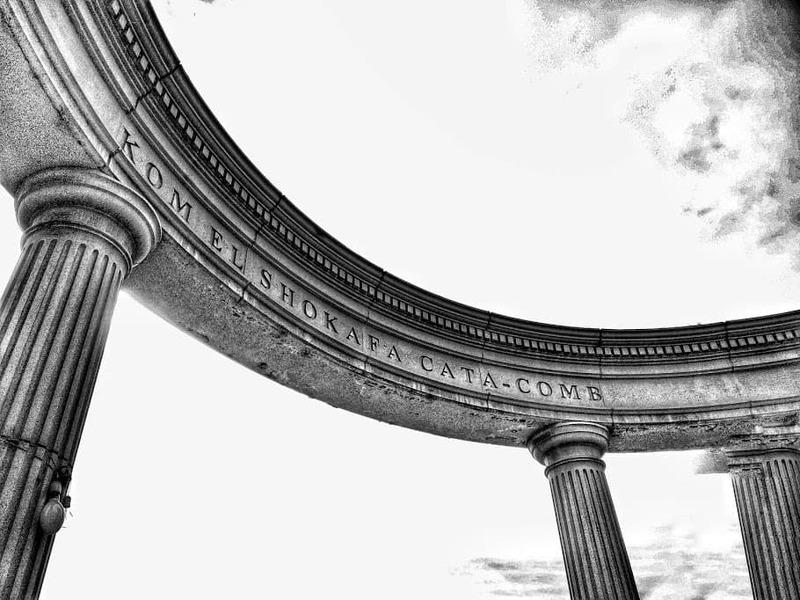 Interestingly, the column actually has nothing to do with the Roman Pompey (Gnaeus Pompeius Magnus) as the column was misattributed during the Middle Ages, but the column was actually built around 297 A.D. to commemorate the victory of Roman emperor Diocletian in ending a revolt in Alexandria. Around the memorial column, you’ll also find a number of statues, artifacts, and the remains of a Serapium, a temple to the deity Serapis. 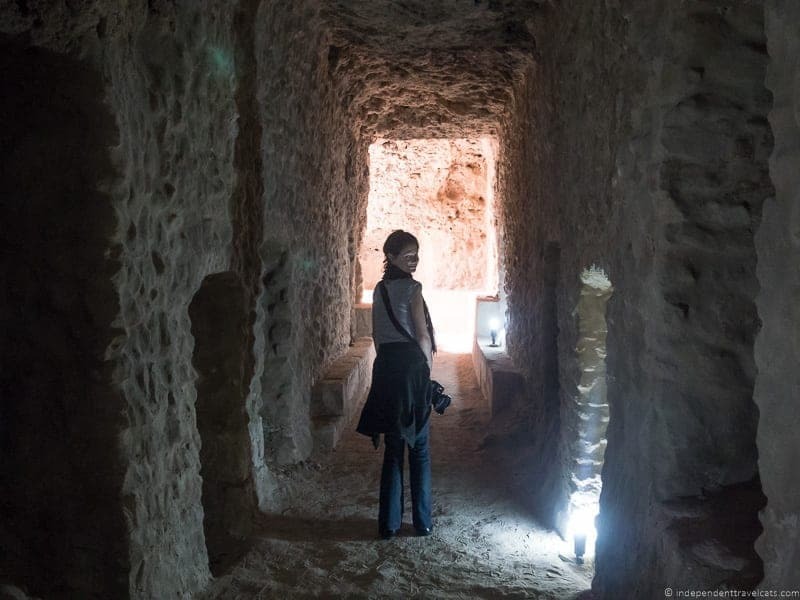 Nearby and within walking distance you can also explore the Catacombs of Kom el Shoqafa, which is a necropolis of 3 sub-levels dating from the 2nd century AD. You descend via a narrow spiral staircase and you’ll find a series of tombs, statues, reliefs, and objects that show an interesting merging of the Pharaonic funeral cult with Hellenistic and Roman influences. Underground passages lead to a pillared lobby, a Roman triclinium which was a banqueting hall where grieving relatives paid their last respects to the dead during a funeral feast, main tomb area, and the Hall of Caracalla. Some of the passages are narrow and the spaces are a bit confined, so probably not the best place for those who are claustrophobic. Photography and cameras were not permitted within the catacombs during the time of our visit. Another ancient site is the Roman Amphitheater, which is the most complete Roman ruin in Egypt. Dating from the 2nd century A.D., it is a small amphitheater that was used by the Romans for poetry and music. On the site, other ruins have also been excavated including a bath house and a villa with some well-preserved mosaics. Families will probably enjoy letting kids explore, swim, and play at the city’s many gardens and beaches, which are also perfect places for a family picnic. Another good bet for families is the Planetrium Science Center located right next to the Alexandria Library, which offers a planetarium with IMAX science-related films, a history of science museum, and the ALEXploratorium which is a hands-on science center geared towards children and young adults. Near the Citadel is the Alexandria Aquarium Museum, which includes a small collection of both live and taxidermied sea creatures. Exhibits focus on species from the Mediterranean and Red Seas around Egypt, as well as some freshwater species from the Nile and the Amazon. The aquarium is quite small and can be crowded; some good exhibits for children but unlikely to impress those who have visited larger aquariums elsewhere. Not that there is also zoo in Alexandria; however, I would urge you NOT to visit this zoo (or any others in Egypt) as there have been numerous and frequent reports and news stories of inhumane treatment, abuse, and neglect of the animals at the zoo. Both local and international animal rights activists have petitioned to have the zoos closed unless they are able to secure adequate resources to properly care and protect the animals. There are several museums that you can visit in Alexandria. Sadly we did not have time to visit any of them on our own day trip, but I would have especially liked to visit the Alexandria National Museum. The Alexandria National Museum is a collection of items that tell the history of the city from antiquity to the modern period. It is housed in the Italianate house of wealthy wood merchant Al-Saad Bassili Pasha that was later the home of the American consulate. This museum is considered one of the best museums in Egypt. Other museums that you might consider depending on your interests are the Greco-Roman Museum (CLOSED and under renovation during the time of our visit), Royal Jewelry Museum, and the Cavafy Museum (a house museum of Greek poet Constantine Cavafy). There are also the museums housed with in the Bibliotheca Alexandrina mentioned earlier and the family-oriented Planetrium Science Center. During our visit, none of the former royal palaces in Alexandria were open to the public but they can be viewed from the exterior. The most poplar palace is the large Al-Haramlik Palace (a.k.a. 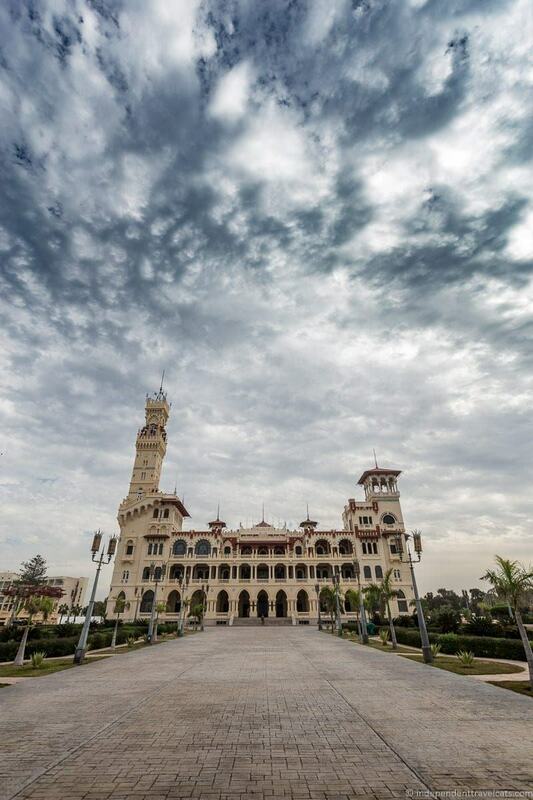 Montaza Palace) built by King Faud I in 1932 as a royal summer palace. After the revolution in 1952, it was also used as a residence for Egyptian presidents. The architecture of the Al-Haramlik Palace is striking as an unusual mix of Turkish and Italian design and it is surrounded by 150 acres of former royal gardens. The gardens are open to the public (entry fee) although the palace is not and is gated and guarded; however you can get a good look at the palace from the gardens. There are proposed plans to eventually open parts of the palace as a pubic museum. The smaller but older Salamlek Palace is also located in the Montaza royal gardens and was used as a hunting lodge and resident for the companion of Khedive Abbas II. The Salamlek Palace has since been converted into a luxury hotel; however, it was closed for renovations during our visit with no specified date for re-opening. 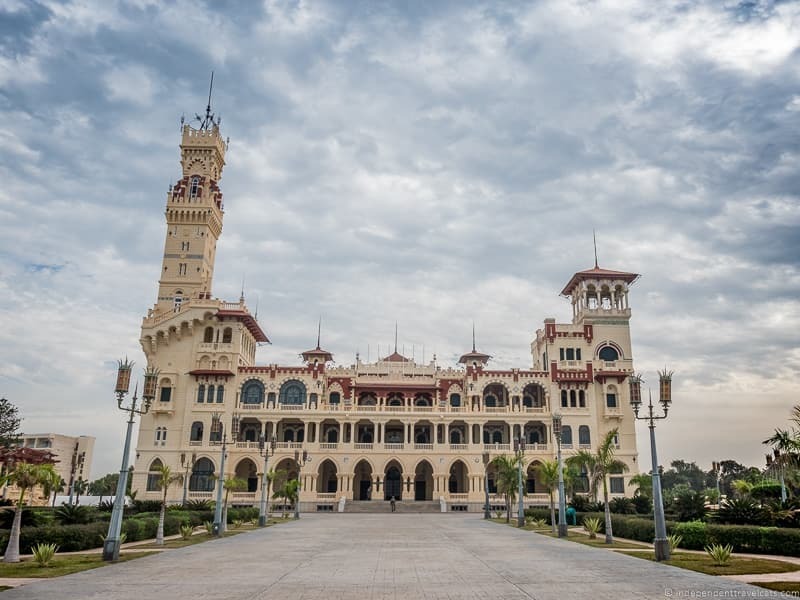 The Ras el-Tin Palace is a former royal palace completed in 1847, and is currently used as one of the official residences for the President of Egypt and is located on a naval base. There is no public access to the palace or grounds although you can view it from a distance. It was at Ras el-Tin Palace that King Farouk abdicated the throne in 1952 and left Egypt with his family in exile. In the central downtown area, you can find plenty of stores selling clothing, accessories, home decor items, and tourist souvenirs. For those interested in antiques, handmade items, and a more traditional shopping experience, you might head to the Souk El-Attraine. The Attraine district, which you’ll find near the pretty Attarine Mosque, is an area full of narrow alleys filled with shops selling antiques (Arabic and European), clothing, spices, home decor, sheeshas (hookahs), and custom-made wrought-iron furniture (a speciality of Alexandria). Note that you may encounter sellers trying to sell you what appears to be Egyptian antiquities; know that it is illegal to remove any antiquities from the country without a permit. For those looking for an up-scale Western style shopping mall experience complete with international brands, food court, and cinema, you might want to head to the San Stefano Mall which is located just behind the Four Seasons Hotel Alexandria at San Stefano. Other popular shopping centers include the City Centre Mall on the outskirts of the city and the Green Plaza Mall located near the Hilton Hotel. Note that is most shops (especially those outside shopping centers), prices will be displayed in Arabic so have your Arabic number cheat sheet (and currency conversion info) handy. 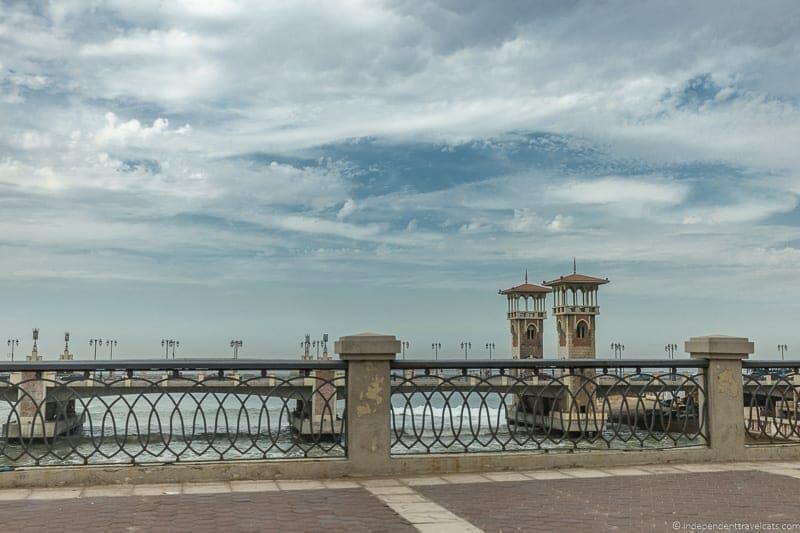 The Corniche is the waterfront promenade that runs for about 10 miles along the Eastern harbor of Alexandria from the Citadel of Qaitbay to the Montaza Palace and is a great area for a walk. Many beaches, seaside restaurants, and gardens can be found along this stretch. There are numerous beaches within Alexandria and in surrounding towns. 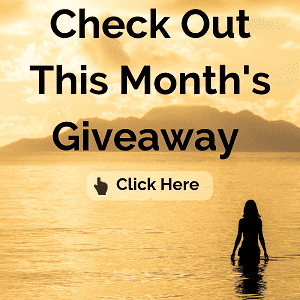 Many are private beaches owned by hotels and resorts (although many you can still pay to access as non-guests) and some are public beaches (an entry fee is charged at many although a few are free). Some of the most popular beaches are the Maamoura Beach, Stanley Beach, and the beaches near the Montaza Palace. Beaches, especially the public ones, can get very crowded in the summer and the level of cleanliness of the beaches (and the water) seems to vary. At many beaches, the entrance fee includes use of beach chairs, umbrellas, dressing rooms, toilets, etc. 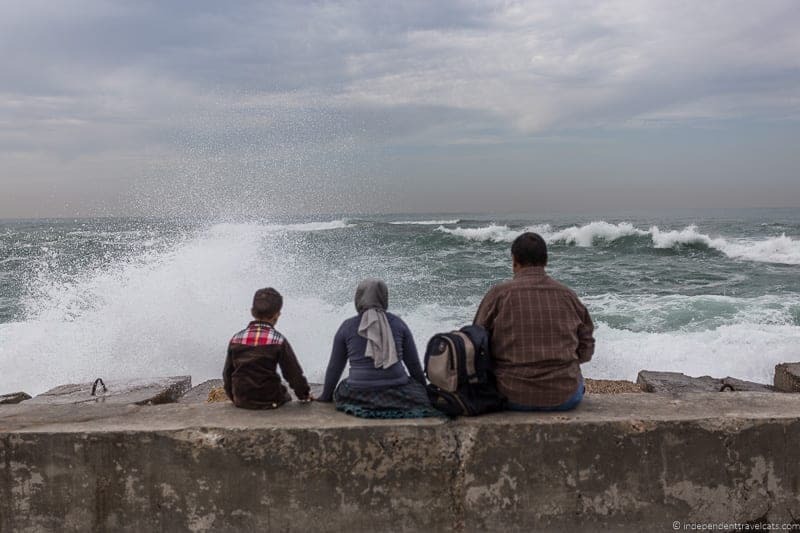 Note that women are expected to be modestly dressed on most Alexandria beaches (most women were fully clothed that we saw), so women who wish to get in the water may want to bring a long cover-up, caftan, or dress to wear over their bathing suit. For women who want to feel more comfortable being uncovered in a bathing suit, the Venezia Beach and Helnan Palestine Hotel beaches are probably your best bets. Here are a list of city beaches and a short guide to some of the best beaches in Alexandria. 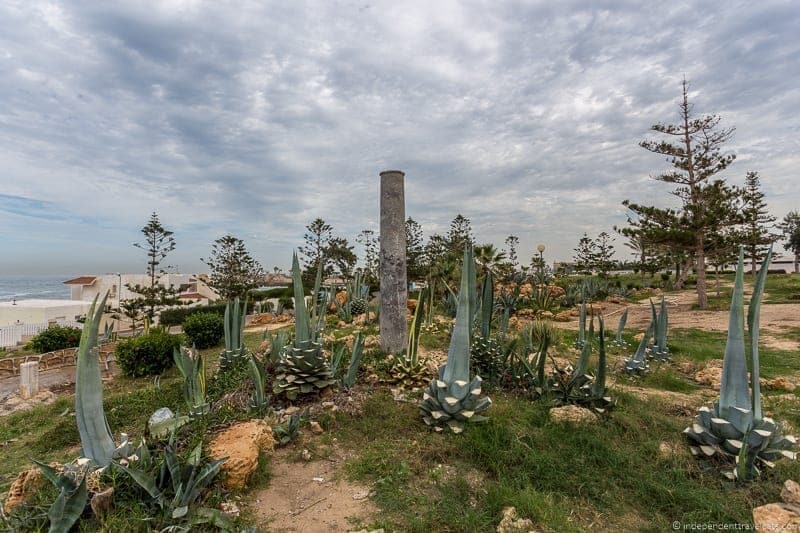 There are several gardens and park you can visit in Alexandria, and they are a great place to take a break, have a picnic, or find a bit of peace and greenery in the busy city. The one we visited was Montaza Gardens which is the 120 acre former royal garden that surrounds the Al-Haramlik Palace. The garden is sometimes called the Love Garden as it is a place where local romantic couples spend time together and is a pleasant place to wander around. 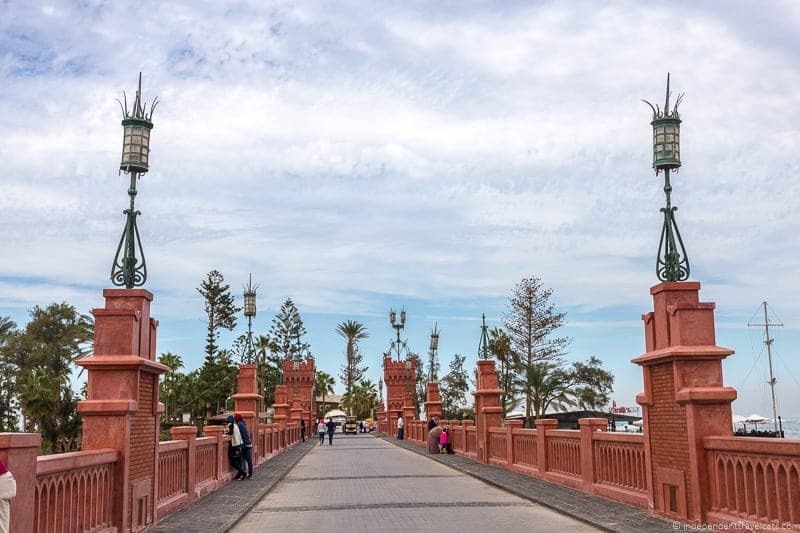 We enjoyed walking across the Montaza bridge to the Tea Palace Island which has beaches, a villa, some restaurants, the Montazah Diving Center, and beaches. Other gardens and parks, include the Antoniadis Gardens (the 19th century Palais d’Antoniadis and park were constructed as a miniature Versailles), Shallalat Gardens, and the International Park of Alexandria (an area designated for recreation, sports, and festivals containing pavilions, sports fields, and playgrounds located near the Alexandria International Airport). Alexandria in the early twentieth century was a cosmopolitan city and a place of inspiration for artists from around the world. It had a large European community and was well-known for having some excellent cafés and patisseries. After the 1952 revolution, many of the popular coffeehouses, restaurants, and clubs closed and many have since been torn down. However, a few cafés and patisseries still remain from that era, including Café Trianon (52 Saad Zaghloul St), Athieneos (21 Midan Saad Zaghloul), Délices (46 Saad Zaghloul St), and Brazilian Coffee (44 Saad Zaghloul St). For those looking for a bit of cosmopolitan Alexandria, I’d also recommend considering a visit to the Antoniadis Gardens as the Palais d’Antoniadis (not open to public) hosted a number of important people in that period, the Montaza royal gardens, the Royal Jewelry Museum, and the Cavafy Museum (Cavafy lived in Alexandria during this period). For nightlife, consider a performance at the small but elegant Alexandria Opera House. If you are staying overnight in Alexandria, we can recommend staying in one of the city’s historical hotels. 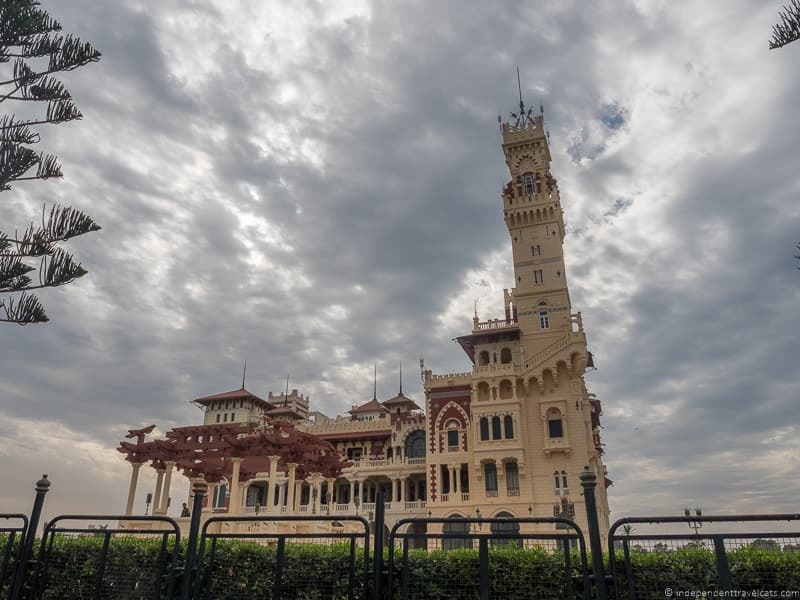 Historical hotels in Alexandria with some Old-World style include the Cecil Hotel, The Windsor Palace Hotel, El Salamlek Palace Hotel (currently under renovation), and Le Metropole Hotel. Fishing, boating, swimming, and diving are popular activities in Alexandria given its place along the Mediterranean Sea. For those interested in fishing, you can try hiring a boat locally or book a fishing trip in advance. Alexandria is not nearly as desirable for snorkeling or diving as the Red Seas given its poor water quality and lack of rich sea life. 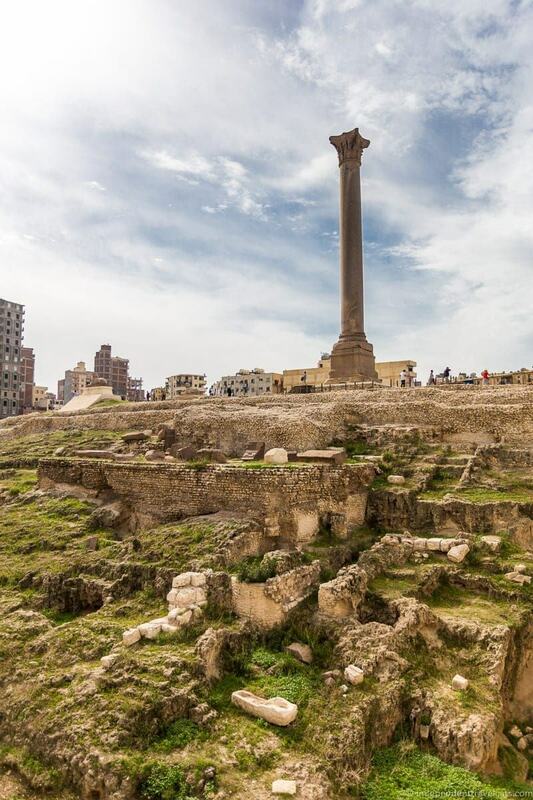 However, history-loving divers may be interested in diving in Alexandria as the harbor includes parts of the ancient Alexandria Lighthouse, sunken ruins of a Ptolemaic palace, Roman trading vessels, artifacts from the former Royal Quarter, and Napoleonic shipwrecks. The issue with diving here is that the visibility can be very poor at times so best to check on conditions from local divers. Guided diving trips and equipment can be rented at Alexandra Dive and Montazah Diving Centre (seasonal) next to Venezia Beach. There you have it, our list of things to do in Alexandria Egypt! We hope the above gives you all you need to plan your perfect Alexandria day trip or a longer itinerary to this famous city. 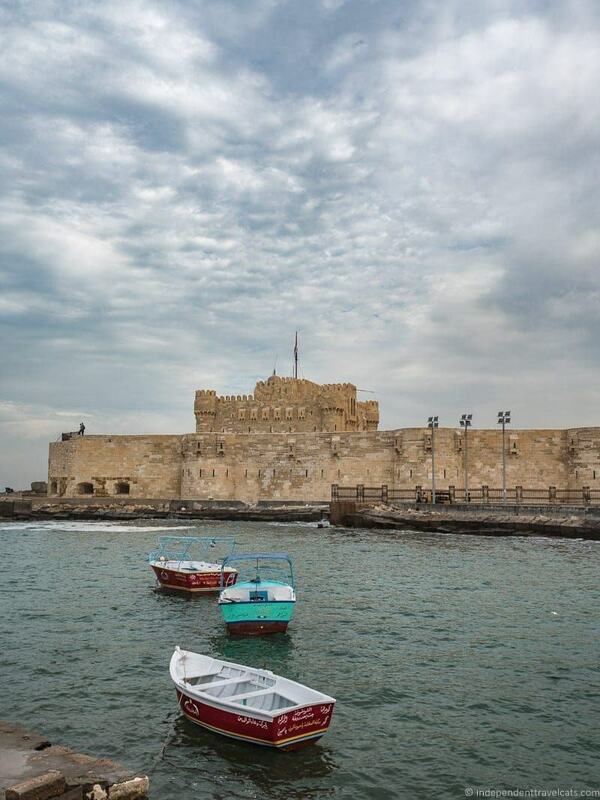 What would you put on your itinerary for a day trip to Alexandria Egypt? Have you been to Alexandria? As always, feel free to ask us any questions about our trip or leave us any tips or advice of your own on things to do in Alexandria Egypt! Indeed it is, thanks for catching that typo in the article. Fixed! Thank you, Jessica, for your valuable inputs. Best wishes, Sushil. Very informative writeup. We are planning a visit to Egypt in Nov this year, and, we were in two minds, Visit Alexandria or skip it. But now after reading your blog we have decided to spend a day here! Thanks for the inspiration! 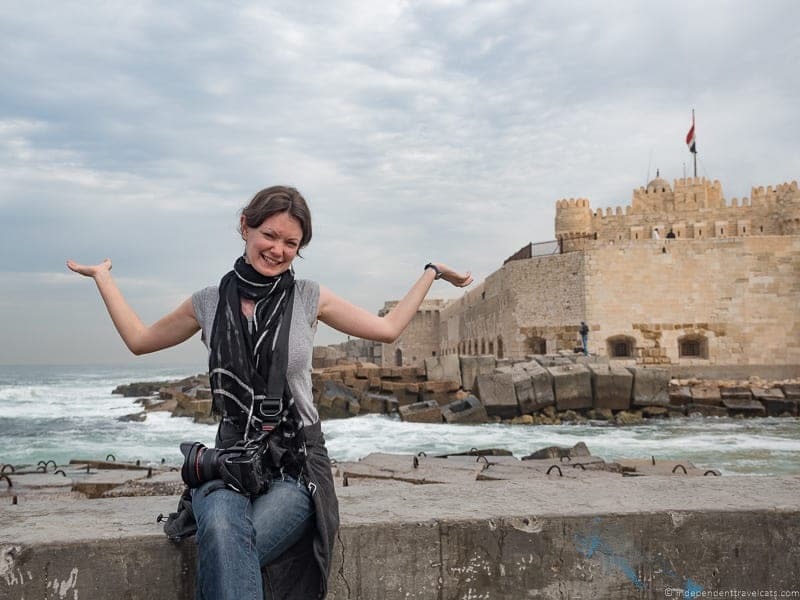 This is a great post on things to do in Alexandria Egypt. I want to stay overnight and need to know the best of hotel with the excellent view on the sea, good restaurant, and sure to serve all kinds of drinks. How much will it cost me? 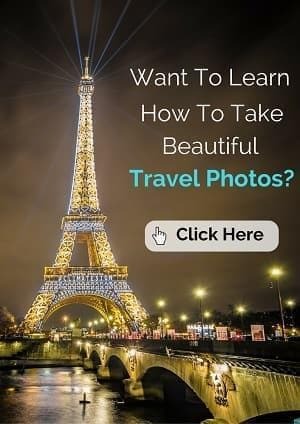 Thanks for great guide, I’m going in two weeks for a 3 day flyer, this will be really helpful! Any idea where is good fo an ‘Ice Cold in Alex’ beer? For beer try Spitfire Bar. Cap d’ Or is also a quirky little bar restaurant that does beer in Alexandria. Thanks Graham for sharing those recommendations for best beer spots in Alexandria Egypt! My pleasure. I take it you don’t like links with the comments? By the way there are liquor stores (off licences for English readers) on Omar Lofty just West of Cecil Hotel, just don’t drink on the street. Thanks for the further info. Perhaps you miscopied the links as they didn’t go anywhere when clicked so I deleted them, but I will try to add appropriate links back in! Thank you for a marvelous resource for planning travel to Alexandria. I have yet to make it to Egypt but it is on my bucket list. I went on a week-long tour of Egypt back in 2009 (before the Arab Spring and everything that followed after that) and it’s one of my fondest memories to date. We visited Cairo and headed down south to Luxor etc. but didn’t visit Alexandria. I’d have loved to see the great library at Alexandria, although it’s long gone! 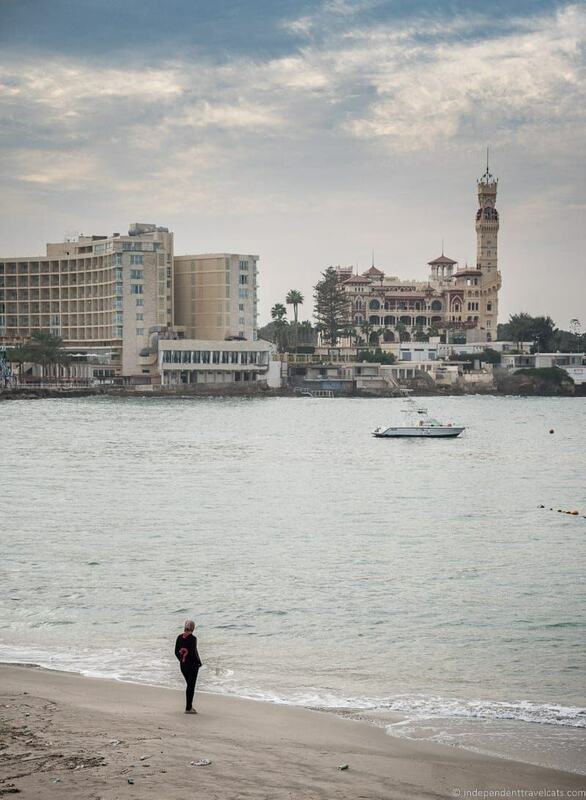 I dived in the Red Sea and it was fantastic but the history-laden waters of Alexandria sound fascinating too! Did you go recently? With the current situation in the Middle East and the various aviation incidents involving Egypt recently, I read that the tourism industry there has taken a huge hit, which is really saddening. Hi Michelle, The history in Egypt is just amazing, makes the ruins of Greece and Rome seem relatively new! Yes, we were just there about 9 months ago and yes, there were almost no tourists. I think the Egypt Air crash (the one to Russia, sadly have to specify) happened the week before we were there. Tourism has been pretty low for years here and it seems to not be getting better. The pyramids of Giza are perhaps the world’s greatest manmade wonder (and the oldest) and there were almost nobody at the viewing point where all the buses stop and about 20 people at the nightly light and sound show. Resorts on the Red Sea were almost totally empty and are slowly deteriorating. It is very sad indeed. Alexandria is less affected than some places that are almost totally dependent on international tourism although it is hurting as well. There have been a number of terrorist attacks and human rights abuses in Egypt so I can understand people choosing to spend their vacations elsewhere to some extent but it is so sad to see the affect on the local people and sites. Very thorough recap of the city, which certainly does seem to have enough to keep you busy for 2-3 days! When we are abroad we seldom visit zoos, aquariums or science museums unless we are told they are truly unique and outstanding. we can do those things at home and prefer activities more unique to the place we are – and that speak to where we are a bit more. What an amazing and detailed guide to Alexandria. I know of it because I used to teach about Ancient Egypt, but you never hear too much about it from a traveller’s perspective. Hello, I visited Egypt many years ago (one of the most interesting trips I have ever taken) but didn’t make it to Alexandria. In Cairo, we heard a lot about the city. And, yes, I would be interested in going since it is related to Cleopatra’s story. I once went to an exhibition showing the many Greco-Roman artifacts (even big parts of cities) under the waters surrounding Alexandria. You said you visited as a day trip but you also mentioned a train trip takes from 2-4 hours. Did you fly? When I visited the country, we flew from Aswan to Abu Simbel for a day trip to the temples. Hi Ruth, Yes, there is an amazing amount of artifacts that have yet to be uncovered both on land and especially in the water in this area. Cleopatra is believed to be buried just outside the city. They keep finding more every year it seems, and part of the lighthouse as well as an entire palace is just beyond where the citadel sits under the water. There are also Roman ships and ones from the days of Napoleon under the waters there. So for divers who like history, it is a really amazing spot. We had a private mini-van (and went along with another couple) so we had a driver and guide. Yes, I am not sure what the quickest way is as it currently takes about 3 hours no matter what you do….drive, train, or fly (45 minute flight but you have to be at the airport an hour early and it is an hour drive from the Borg El Arab airport to the city center). Train is probably a tad quicker if the train is on time and you take an express one. I think it took us 2.5 to 3 hours each way with a break each way for coffee/food. So it was an early start (6 or 6:30am I think) and long day which is why I’d recommend staying overnight for at least 1 night if one has the time. Thanks for this great article, Jessica. This is one of those places I want to see before I die. You don’t come across that many articles about Alexandria, so I find your article really useful. 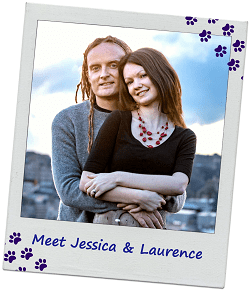 It seems that you and Laurence are going everywhere fun in this world. I kind of envy you. Looks beautiful! Way more than I thought Alexandria Egypt was going to look. Jess, What a great article. Alexandria was the one city we didn’t get to visit when we went to Egypt. I did know that there was the new library, so maybe it’s time to go back. What a thorough guide to Alexandria! I would love to visit Egypt one day but haven’t thought about where to begin! This should help for the future! 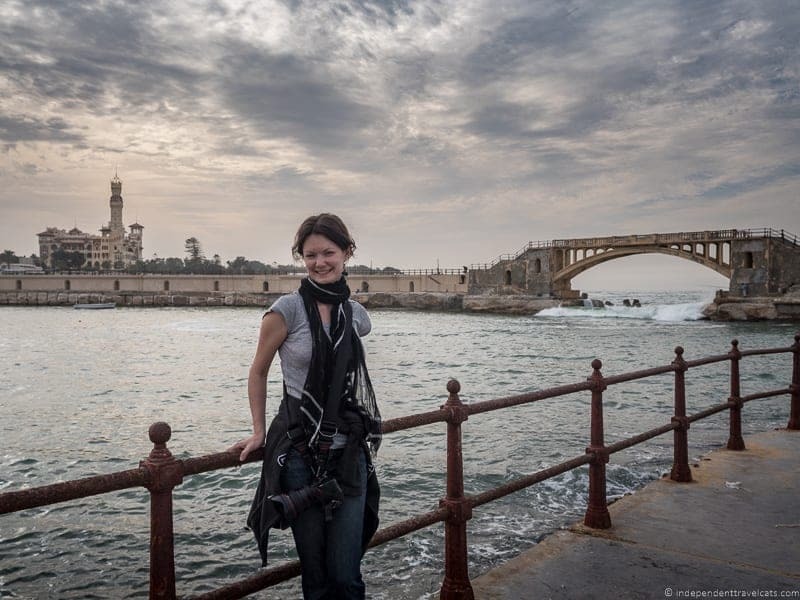 Wonderful to read your blog, especially enjoyed this piece about Alexandria Egypt. Your writing is sooooo good, the photos intriguing and you both look great. Thanks for personalizing yet another classic destination!